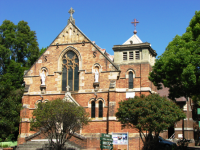 St. Patrick's Catholic Parish Kogarah, in the Archdiocese of Sydney, is a community of people of diverse backgrounds united by God through the Gospels, the teaching of the Catholic Church and the pursuit of common goals. We call on all the members to offer their unique gifts in a Christ-centered community, as we proclaim the Word of God, celebrate the sacraments, and promote education, hospitality, justice and service. St Patrick's Catholic Parish will be a joyful Christ - centered community living in solidarity and justice and in full communion with the Roman Catholic Church. St. Patrick's is a Catholic primary school located in the St. George area. It was founded in 1862 and was originally staffed by lay teachers. The Sisters of St. Joseph provided the ministry for the school from the early 1900's until 1986. Since this time, lay leadership under the direction of the Catholic Education Office, Sydney, has led the school. In 2009, St. Patrick's has an enrolment of 328 students with twelve classes. The class structure is a mix of single and double stream. Holy Mass with the Sacrament of Baptism.